admin | Gill Rock Drill Company, Inc.
Drilling rigs are at the foundation of every mining operation, tunnel, water well, and major construction project. Used to penetrate the Earth’s surface, there are various drilling rigs available to suit any specific environmental need. Most drill rigs and associated equipment are portable, to some degree. They may be one man operations or require an entire crew with heavy equipment to manage. Some drilling rigs can be utilized in multiple applications through the ability to change drilling heads, which bore holes from 4 inches to 24 inches in diameter. A drilling rig is classified by several attributes. Power sources may be mechanical, electrical, hydraulic, or pneumatic. Height, measured by the number of pipe lengths that can stand in the derrick when changing bits, is referred to as single-, double-, triple- or quadri- stand. Drilling methods include push drilling, where no rotation occurs, rotary table drilling, top drive rotation, sonic, and percussive. Derrick position may be vertical or at a 45-degree slant. The type of drill rig required for a specific job will be based on the reason for drilling, the type of subsurface being drilled, and the scope of the operation at hand, from deep earth core samples to massive bridge pilings. Augers employ a helical screw with a bladed bit to drill into sub-surface soils. The debris “rides the flights” out of the hole as the auger drills deeper. The stem may be solid or hollow to allow concrete grout to be pumped into the hole, creating a cast piling that will support heavy loads in weak soil. 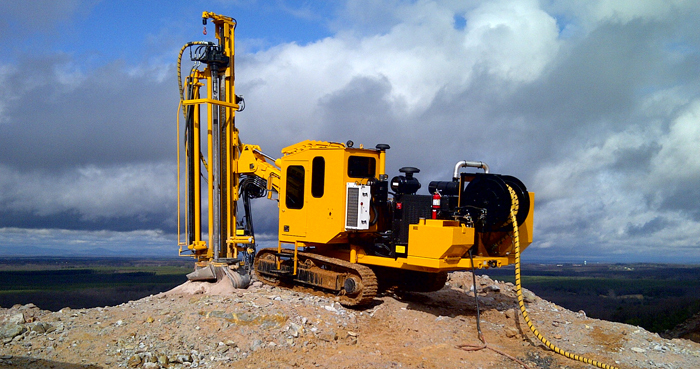 Percussion Rotary Air Blast (RAB) drilling is primarily used for mineral exploration. Also known as down-the-hole drilling, this method employs a pneumatic hammer with tungsten “teeth” that chew away the rock surface as the debris is blown up and out through the excess space surrounding the rod. Air Core drilling is very similar to RAB drilling, but is used in softer soils and, because it has a central evacuation tube to move debris out of the hole, more accurate soil samplings may be taken. Cable tool drill rigs are used to drill water wells in bedrock aquifers. A cable raises, turns, and drops a hammer, pulverizing the soil in the hole. The debris is then mucked out by a “bailer”, a bucket with a trapdoor bottom, that scoops out the overburden. The hammer is then re-employed and the process repeats. Direct push drilling is similar to cable tool drilling except the hammer does not rotate. It is used for drilling into in very soft soils. The hallmarks of a good drilling company, as well as a good drill rig are reliability, versatility, and affordability. Your supplier should be able to provide all tools, equipment, service, and instruction to ensure your best success. Rely on Gill Rock Drill Company For Dependable In-House And On-Site Repair And Service! Does your enterprise perform drilling operations with some frequency? If so, you appreciate the importance of obtaining dependable service and maintenance for your equipment! Unplanned “down time” costs companies in this industry thousands (and even tens of thousands) of dollars. When you use the renowned Gill Beetle Drill, you’ll have access to dependable, expert on-site and in-house maintenance and repair services. We fully support our product lines and our customers. As a leading manufacturer and vendor of specialized drilling equipment in Pennsylvania, we offer experienced customized services. Your company can ask us to help modify your drilling products to meet the unique needs of your marketplace. We also offer contract rock drilling and the assistance of a trained drill crew. You can essentially test out our products before you enter into a purchase agreement by requesting rock drilling equipment rentals first. See for yourself how well our superbly manufactured product lines and trained personnel advance your field operations! Our company has manufactured drilling products for decades. We understand the needs of businesses serving customers in niche drilling markets. Whether you require rock drilling equipment for construction and infrastructure projects, for drilling water wells, for mining, or for virtually any other purpose, you’ll want to consider our fine equipment. Our specialized contract rock drilling service can help you keep your projects in the field on time and within desired targets. Today so many drilling companies depend heavily upon the implementation of regular, periodic maintenance programs. Service by experienced technicians can help keep equipment running smoothly in the field. No one appreciates costly breakdowns or sudden drill failures. Enterprises which prioritize service and maintenance highly may discover they obtain the best value from their investment in heavy equipment and specialized drills by contracting for regular maintenance and repair services. Whether you require an experienced rotary drill pipe supplier, capable in house maintenance and repair services, or short or long term equipment rentals, we’d like to assist you. Our company has served clients throughout the Eastern Seaboard for generations. You can count on our expertise to help you solve many different types of challenging drill and equipment problems. We want to support your drilling company’s effort to provide superb customer service. Can we assist you? Simply give us a call at (800) 334-3117 to discuss your drilling service and repair needs. We look forward to speaking with you! Geothermal energy produces zero carbon emissions. By using this rigging system to implement a system of your own, you can be a part of the population which is actively helping to make the air and water around us cleaner each day. This can be achieved all without lifting a finger. We are happy to do all of the work for you. We work to minimize any disturbances to your property when drilling and thus when the project is done, you won’t even know that we were there. By using this type of rig, it is very predictable the amount of energy that can be extracted from the ground beneath you. This means that you can accurately have your system designed to meet all of your energy needs and rely far less on traditional power sources. What many people fail to realize about these systems are that they are not just for heating. They act as wonderful cooling systems as well. In the winter, warmer air is brought up from the ground and used in a building as heat. In the summer, this same heat pump works in reverse to get the warm air out of your house and replace it with much cooler air from the ground. This is possible through this drilling technology and the relatively constant underground temperature year round. We work to minimize costs to the consumer both when conducting the actual drilling process and when accounting for the reduced energy bills in the future. Because the fuel of your system is now seen. It is easy to see how this process will eventually pay for itself over time thanks to this state of the art drill rigging technology. If you are in need of a geothermal rig or rigging accessories, then be sure to look further into Gill Rock Drill Company for everything that you’ll ever need. For all of your drilling needs, Gill Rock Drill Company is here to provide professional and reliable technical expertise. We offer contract drilling, service, and rentals for all of your drilling projects. Get contract drilling with our highly skilled and professionally trained drill crew, or rent premium drilling equipment for your projects. We have long-term rentals along with flexible daily, weekly, and monthly rentals to suit your your needs. Come visit us and find the right rock drill for your next project. We are full service manufacturers and distributors that offer the most professional drilling equipment guaranteed to meet your needs. Get all of your tools and supplies at this one-stop shop. Drill companies across the US trust us to provide outstanding drilling machines. Whether you do it yourself or hire professionals like us, you know that it is crucial to select the right tools and equipment for the job. Our team is available to answer any questions you might have about drill equipment, repair, and other supplies. You can always turn to Gill Rock to provide high-level service, including training and support. If you’re looking for a wet drilling machine, you will find durable and lasting commercial grade equipment that is built to last. You can count on us to have a vast selection of drilling machines, including a huge fleet of Gill Beetle Drills and air compressors selected to meet the requirements of the job. We also sell used Gill Beetle Drills and air compressors, along with any accessories you might need. We have you covered with full repair and maintenance services for all water well drill and accessories. If you need rotary drill service or routine repairs and maintenance, come to us for high quality work. We provide the best engineering and technical services to design drilling tools customized to your needs. We also manufacture stabilizers. Choose from ribbed Straight Stabilizers, ribbed spiraled Stabilizers, or Over the Hammer Stabilizers. We also have friction sockets and open side rope sockets. Other items include friction sockets, drill pipes, rotary adapters, dart style bailers, lift bails, and fishing spears. Whether you’ve worked with professionals or undertook the laborious task of drilling, you know that rock drilling is a highly specialized field that requires high-tech expertise and knowledge to ensure high quality work and compliance with safety regulations. You can rest assured that you are up to date with today’s safety standards and advanced technology. Drill companies depend on us for professional grade machinery. 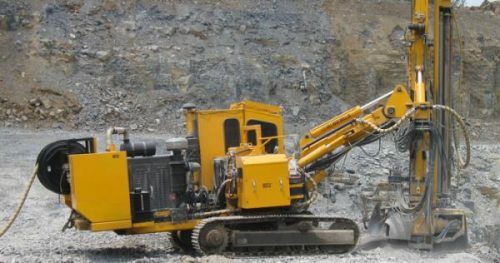 Our drilling machines are durable and use precise technology to penetrate rocks for construction, well digging, and mining. Gill Rock is a one of the largest distributors of drilling tools and supplies. We proudly feature on site or in house repair and servicing for your drilling equipment, including our drilling machine and accessories. Aside from selling top of the line products, we also service, repair, and sell all kinds of drilling tools and supplies. We also provide rotary drill service and repair. Browse our wide selection of top hammer products, including DTH hammers along with any bits and parts you might need. We also sell cable and rotary drilling supplies such as pipe winders, wrenches, and grinding wheels. If you need foam and grease to keep your equipment in top shape, we’ve got that, too. Come visit us for your drilling tool repair needs and bit sharpening. If you use DTH hammers, we can help you select the right hammer from our huge selection, and also provide rebuilding and repair services for your equipment. Gill Rock is your trusted equipment supplier for all of your drilling projects and repair needs. We have solid rapport with our customers based on our principles of professionalism, integrity, honesty, and trust. With our team of professionals and selection of high grade drilling products, Gill Rock is your rock drill equipment supplier for 2018 and beyond. A full range of DTH hammers, bits, and all the parts needed for the job. A full range of hammer products. Cable and rotary drilling supplies, which include greases, foams, wrenches, pipe wipers, and grinding wheels. When it comes to our geothermal drilling rig and accessories, we offer full repairs and other services, such as bit sharpening and hammer joint breaking. Whether it be contract drilling, rentals, service, or support, you can always rely on Gill Rock Drill Company to provide training and technical expertise. Gill Rock Drill Company is a full service manufacturer and distributor of drilling equipment, tools and supplies, such as our geothermal drilling rig! Contract drilling with our trained drill crew. Fleet of Gill Beetle Drills and air compressors chosen specifically to meet the job’s needs. In house or on site servicing and repair of drilling equipment, which includes all of our geothermal drilling rig and accessories. Used Gill Beetle Drills and air compressors for sale, along with all of our geothermal drilling rig and accessories. Daily, weekly, monthly, and long term rentals. Whether it be contract drilling, rentals, service, or support, you can always rely on Gill Rock Drill Company to provide training and technical expertise. Gill Rock Drill Company is a full service manufacturer and distributor of drilling equipment, tools and supplies, such as our water well drill! In house or on site servicing and repair of drilling equipment, which includes all of our water well drill and accessories. Used Gill Beetle Drills and air compressors for sale, along with all of our water well drill and accessories. Cable and rotary drilling supplies, which include greases, foams, wrenches, pipe wipers, and grinding wheels. When it comes to our water well drill and accessories, we offer full repairs and other services, such as bit sharpening and hammer joint breaking. When it comes to using a blast hole drill, you’re going to need to have the best equipment available on the market. At Gill Rock Drill Company, we are our own supplier and manufacturer, and only provide the best tools and equipment for our customers, which include our blast hole drill. For the perfect drill to get the job done, while keeping the work area both productive and completely safe, especially if the work is being conducted within a mine, you’re going to need equipment that caters to efficiency, reliability, and durability. We only sell our customers tools and equipment that is both safe and gets the job done properly, without burning a hole in their wallet! A fleet of Gill Beetle Drills paired with air compressors that are specifically chosen for jobs specifically. On-site or in-house repair and servicing for all drilling equipment. Used air compressors and Gill Beetle Drills, which use our blast hole drill, currently available for sale. Daily, weekly, monthly, and long-term rentals on a blast hole drill. Our blast hole drill has the perfect balance of rotary head performance, depth capacity results, bit load, and air flushing, to ensure a smooth, proper performance through ease of use. Our equipment overall is known for being incredibly durable, having lightning speed, and agile mobility. Thanks to the incredibility of the equipment and tools that we currently offer, our customers are constantly reassured that drilling with our brand is made easier through advanced pipe changing, leveling, and tramming, thanks to our latest and greatest through our machinery. Grill Rock Drill Company is a major distributor of drilling tools and supplies. Rotary and cable, down the hole and top hammer, we sell, service, and repair all types of drilling tools and supplies. All of our construction drilling rigs are of high-performance, advanced, and are ideal for multiple applications, which include construction drilling, gas utilities, water utilities, and multiple other difficult and unique construction drilling rig jobs. All of the products we offer when it comes to a construction drilling rig are the best on the current market, one of them being our Gill Beetle Drill. Easy to operate and maintain, with routine upkeep and repair that can be done by the owner or the operator. Drills holes at 4″ to 24″ in diameter. Has an optional 2-speed rotary head. Low operation costs, with new, used, and rental options available. Contract drilling through our crew trained to operate drills. A fleet of Gill Beetle Drills and air compressors that are specifically chosen for the job’s needs to be perfectly met. On-site or in-house repair and overall servicing of all drilling equipment needed and in use. Used Gill Beetle Drills and air compressors currently up for sale. Here at Grill Rock Drill, our goal is to build strong, lasting relationships with our customers based on honesty, integrity, and trust. To learn more about the services we offer or to design your specialty equipment, contact us. Our experienced team is here to meet your mining, construction, and drilling needs.